I’ve received a lot of messages about my living room decor over the past few months, so I’ve decided to write a blog post explaining a bit how I managed to create my gallery wall. Hope it will help some of you guys during your creative process! 1) Before doing any creative projects, I always, always check up some inspirations beforehand (on Pinterest most of the time). This way, I can define what feel I want my designs to have. Don’t forget : it’s impossible to write a good book if you’ve never read one. 2) Pick a wall. I’d say the best one to choose would be the emptiest of any room, to avoid making it look too busy. 3) Try to evaluate the amount of frames you want to fit on it. In my opinion, the best and cheapest place to buy frames is IKEA, otherwise I also find them at flea markets or thrift stores for few dollars. 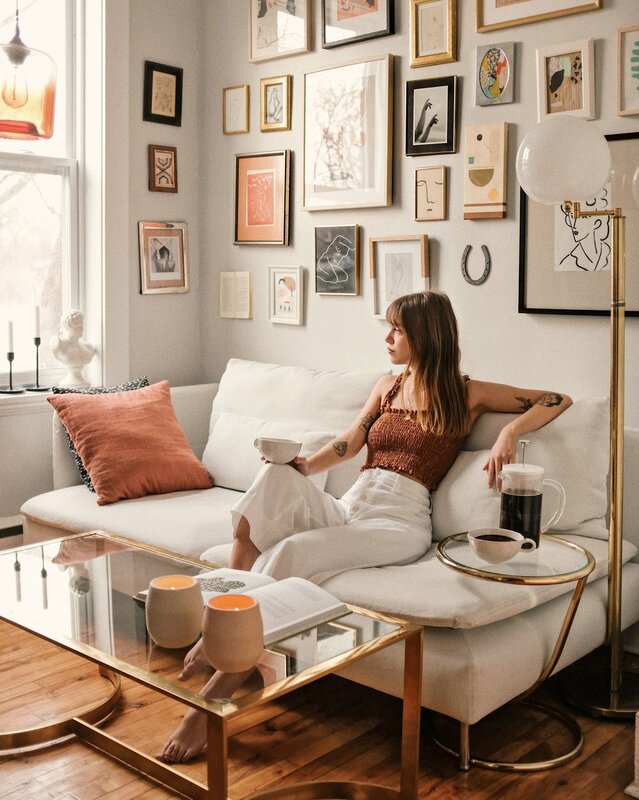 Don’t forget your gallery wall is not supposed to cost you a fortune, since the main goal is to make it accessible for everybody who wants to showcase their favourite artworks. Here are a few models that I bought at IKEA : Virserum, Hovsta, and Ribba. Think about balance : play with levels, alternate between big and small frames and don’t leave any empty awkward spots. No need to take any real measures : it can be as simple as a small layout with squares representing your frames. Personally, I’ve put nails super randomly and it ended up looking good (surprisingly), but if I were you I would do some planning just in case. 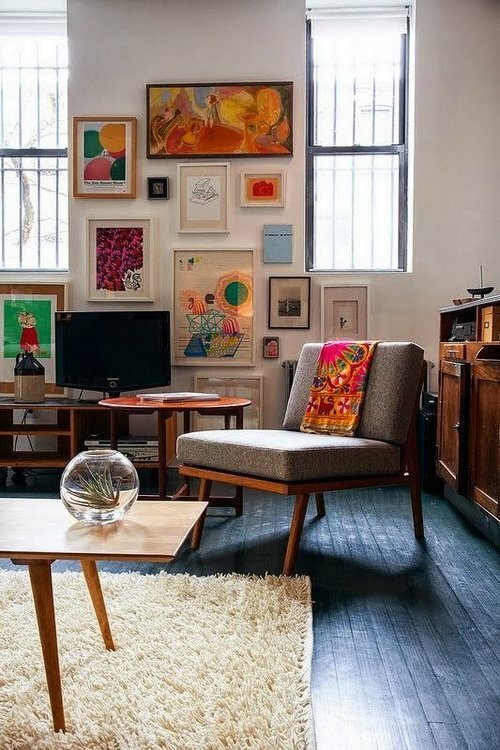 5) Hang your favorite artworks at eye level or a little bit higher. It may seem odd, but if you hang your main pieces too low or too high, you can lose the impact. My advice would be to put the biggest prints/frames in the spotlight (usually in the center of any composition) and the smaller ones around : that way they seem to gravitate around the key elements. 1) Think about a theme. If you want your gallery to look harmonious, you need to make sure the colors, the textures and the shapes can inhabit in the same universe. Don’t be afraid to take risks and match contemporary pieces with vintage ones : the best trick is to mix wether very contrasting or very similar artworks. 2) Alternate the mediums: photographs, paintings, graphic designs, illustrations, abstract art, etc. Be creative, you can even try to hang something different than a frame! For my gallery, I’ve recently decided to screw a book and a horseshoe. 3) If you’re on a budget, printing out some or your favorite illustrations at home could be a good backup solution. It’s always better to encourage your local artists by buying their prints, but if it’s only to fill up temporarily the smallest frames, go for it!